Robin Hood Bicycles (A.G. Reynolds and Co. Ltd., 1960) Advertising Poster (30" X 40"). Woman with Robin Hood bicycle made in Nottingham, England. Robin Hoods were the budget brand of the Raleigh Bicycle Co. These were produced during the 1950s and each bears the distinctive Raleigh Phoenix trademark image. 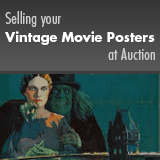 This posters dates from the early 50s and is in the UK double crown format. Very Good/Fine condition.